“Bali Starling (Leucopsar rothschildi) Bird Release, saving the mascot of Bali from extinction” is not just a slogan but also FNPF’s real implementation in conservation since FNPF first released the first Bali Starling on Nusa Penida in 2006. FNPF’s preservation programme has already received attention from various parties in the Indonesian government, including the visit to Nusa Paneda by SBY and the first lady in 2007 to release 4 Bali Starlings. 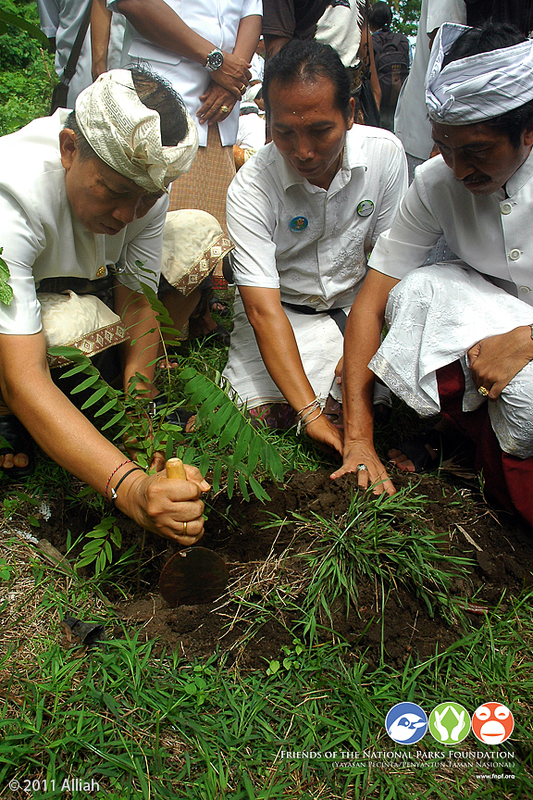 This release of 10 Bali Starlings on November 27th 2011 attracted the Governor of Bali, Mangku Pastika Made, to attend. Prior to releasing the 10 Bali Starlings, in his speech the Governor thanked FNPF and Nusa Penida communities for making the project such a success. It is the unique partnership between FNPF and the local communities that has made Nusa Penida a safe location to release these very rare and valuable birds. FNPF’s ongoing community development programmes ensure that the every village continues to enforce Balinese customary law (awig awig) that protects the birds from being stolen for sale on the black market. FNPF plans to release another 10 Bali Starlings from a different genetic blood-line in July 2012, and to continue to do so every 6 months until the population is viable in terms of numbers and genetic diversity. This bird release was su pported by U.S. Fish & Wildlife Service, Humane Society International (Australia), and Alan El- Kadhi who contributed to purchase the cage bred Bali Starling from Indonesia’s leading Bali Starling breeder, Soeharna Oetodjo from UD Madju Terus in Bandung and rehabilitate them for 6 months at FNPF’s bird centre on Nusa Penida. The release of these birds will increase the genetic diversity of the existing Bali Starling population of Nusa Penida (the 64 Bali Starlings released previously on Nusa penida by FNPF were all bred from just 2 mating pairs of birds). Besides releasing the 10 Bali Starlings, the Governor of Bali participated in a number of other FNPF activities that protect wildlife and habitat, and assist the communities in Nusa Penida. Those activities included the symbolic handover of one of the 45 education scholarships and 1 of the 43 village development grants that are donated each year by FNPF. The Governor also planted a Johar tree. FNPF installed a Bali Starling nestbox with a plaque to commemorate the Governor of Bali’s attendance at the event.